In 1930, as District Attorney of Alameda County, Warren successfully prosecuted Sheriff Burton F. Becker for corruption, despite the sheriff's support from a deeply-entrenched local chapter of the Ku Klux Klan. On July 29, 1939, California Attorney General Warren personally oversaw a coordinated raid on four gambling ships anchored off the coast of Santa Monica. They had been operating for more than a year, three miles from the coast. One ship, the S.S. Rex, managed to keep law enforcement from boarding for eight days, by the use of a firehose. In a June 1943 speech at the National Governor's Conference in Ohio, Warren cautioned: "If the Japs are released, no one will be able to tell a saboteur from any other Jap. [...] We don't want to have a second Pearl Harbor in California." In his memoirs decades later, he noting having "since deeply regretted the removal order and my own testimony advocating it, because it was not in keeping with our American concept of freedom and the rights of citizens." Was Thomas E. Dewey's running mate in 1948. Bitterly denounced in 1961 as pro-Communist by the John Birch Society, which in a nationwide campaign purchased billboards emblazoned with the slogan "Save Our Republic! 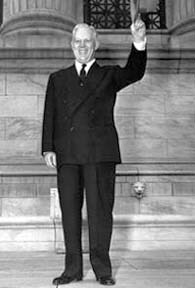 Impeach Earl Warren" alongside an American flag. In Robinson v. California (1962), the Court ruled that drug addiction was an illness, and therefore struck down a California law which had made it a crime to be addicted to a controlled substance.